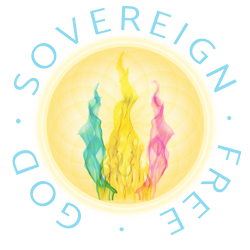 God source code is a Trinity Wave accessed through the merging of polarity, such as the merging of masculine and feminine energies, our species has been suppressed through Bi-Wave Influences that split apart the gender polarity making it impossible to connect to God Source through the sacred union of the male and female. Sacred Union is our divine birthright and this organic architecture is now being returned to our species during the Ascension Cycle as Hieros Gamos. This gender polarity pattern is changing now on our planet and we are able to access a new Trinity Wave or unity code through these male “Rod and female Staff” embodiment. This embodiment is also referred to as Hieros Gamos, and is the foundation of the HGS system. Guardian Assignments include Starseed couplings have been a work in progress in the planetary field architecture since February of 2009 to sequentially dismantle the polarity(bi-wave) of the Vesica Pisces harness and the NRG program headquartered in the United Kingdom. The use of these structures on the planet is to collect, siphon and transpose life force and sexual energy from human beings and to promote enslavement and Sexual Misery. (To override this extreme polarity distortion these couples build a platform for the Trinity Wave field which allows true tantric (heart) union to occur.) The revelation hidden inside these “sacred unions” are astounding as they have so many different dimensions of purpose for the Ascension process. 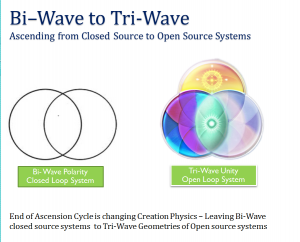 The source code or Unity Field intelligence field is a Krystal Star (Christos Consciousness) hub accessed through the merging of manifested bodies holding trinity wave formats that connect directly into the Eternal Source light (Godhead). The three sound-wave-tone parts when merged into internal energetic balance become designed as one component that access directly into the feedback loop exchanging with the Eternal source supply. This exchange with the Threefold Founder Flame godhead is the principle of Christos, an inner sustained eternal source light which signals the end of vampirism or consumptive modeling on planet. This is what it means that the Godhead cannot be reached by anything but the Christos Consciousness (Krystal Star Tones),KA_RA_YA_SA_TA_AA_LA_(KRYSTAL) although this process of unifying consciousness with the Godhead is known by many different names. This page was last edited on 20 February 2016, at 20:54.